Cetaceans (whales, dolphins, and porpoises) are marine mammals which descended from artiodactyls during the early Eocene, their closest modern being hippos (Hippopotamidae). This discovery has led some authors to combine the Cetacea and Artiodactyla into a single common order known as “Cetartiodactyla”. Cetaceans themselves are the most diverse and the most specialized of all marine mammals, represented today by 13 families with almost 90 species divided between them. They range in size from the 1 meter long, 50kg Hector’s Dolphin (Cephalorhynchus hectori) to the 30m long, 190,000kg Blue Whale (Balaenoptera musculus), the largest mammal known to have ever lived. Molecular evidence has shown that cetaceans are part of the whippomorph clade within the Artiodactyla; a subgroup which includes hippos along with the extinct anthracotheres and entelodonts. The origin of these animals appears to have been centered around southern Asia along the coast of the ancient Tethys Sea: a shallow seaway which once separated Asia and Africa before the former islands of India and Arabia joined the greater Eurasian landmass during the early Oligocene. The first identifiable cetaceans are present in this region by the early Eocene, most likely having descended from a family of semiaquatic artiodactyls called the Raoellidae. Odontoceti (toothed whales)- Of the three cetacean suborders, the Odontoceti is the most diverse: comprising 72 of the 85 modern species. Included within this group are the modern dolphins (Delphinidae), porpoises (Phocoenidae), beaked whales (Ziphiidae), sperm whales (Physeteridae), and narwhals (Monodontidae), along with several species of freshwater dolphins in their own distinct families. As their common name suggests, the primary feature that distinguishes these whales from their filter-feeding relatives (see below) is the retention of teeth as adults. Another characteristic of this group is a type of sonar known as echolocation. At its simplest (see the embedded video below for a more detailed explanation), echolocation in odontocetes occurs when repetitive clicking sounds produced in the airway are amplified by a special organ in the forehead known as the “melon”, producing a focused beam of sound. These outgoing sound waves bounce off distant objects and the resulting echoes are then received through complex fatty tissues along the lower jaw en route to the middle ear, producing an accurate image of distant objects. 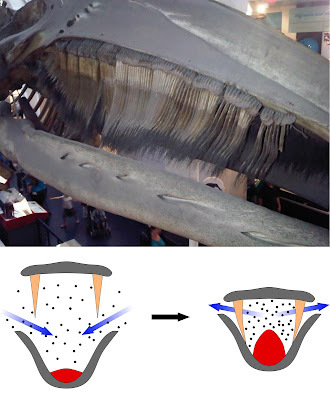 Echolocation has been employed by toothed whales at least since the early Oligocene and may have originated as a means to locate prey buried in sediment, in murky water, or in other areas of low visibility. Mysticeti (baleen whales)- The Mysticeti contains the largest of all cetaceans and, indeed, the largest of all mammals. 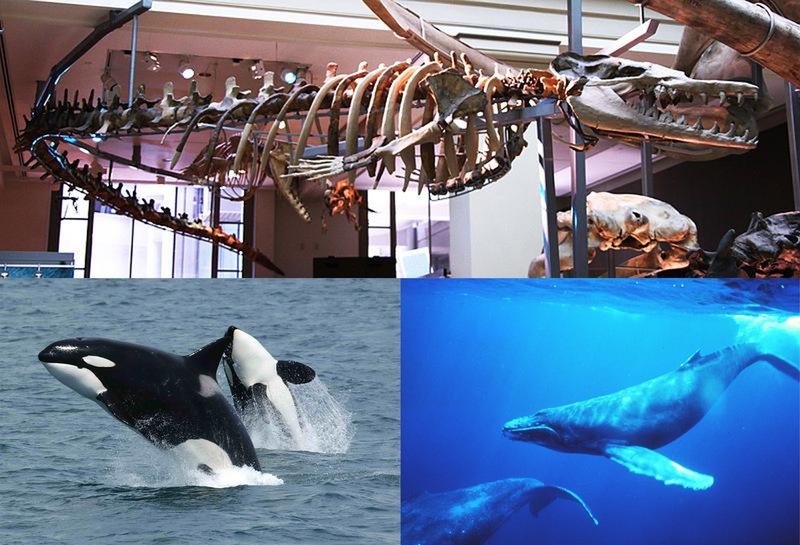 Modern families include the Eschrichtiidae (gray whales), Balaenidae (right whales), Cetotheriidae (pygmy baleen whales), and Balaenopteridae (rorqual whales). Mysticetes are unique among the cetaceans in that they feed by filtering small prey animals in bulk from the surrounding water using baleen plates: dual rows of keratin bristles that protrude down from either side of the palate, resembling a pair of massive brushes. When feeding, these whales take in large volumes of water that contains clusters of an intended prey item. The water is then pushed out the sides of the partially opened mouth by pressing the tongue against the palate, leaving the prey trapped against the baleen plates to be swallowed. The earliest mysticetes, such as the early Oligocene Fucaia buelli, have been suggested to have employed suction-feeding as a precursor to the aforementioned filter-feeding. Suction-feeding involves the rapid expanding of the oral cavity, creating a pressure difference between the inside of the mouth and the surrounding water, engulfing nearby prey items. This technique is used by modern beaked whales, which are mostly toothless. All cetaceans are generally highly vocal animals, but mysticetes are known for producing complex vocalizations known as "songs", especially by males during breeding season. These songs vary in complexity from one species to another, may be heard for hundreds of kilometers away, and tend to be region specific. The following video provides better insight into the anatomy and function of whale song. of the filter-feeding process of baleen whales. Strengthening of the lumbar (lower back) and caudal (tail) vertebrae, with their associated muscles powering the vertical tail stroke. The cervical (neck) vertebrae, meanwhile, are reduced or fused to gain stability. Ribs that are bound by flexible cartilage to allow the ribcage to collapse under water pressure as they dive. The lungs are able to collapse along with the ribcage, maintaining a balance of internal and external pressure and preventing them from rupturing. Sealable nostrils which have migrated from the tip of the snout to the forehead, known as the “blowhole”. This enables cetaceans to breathe without needing to cease swimming or raise their heads completely above the surface. Streamlining of the body achieved through the reduction and eventual loss of the hindlimbs, loss of fur and external ear lobes, and genitalia concealed within the body cavity. Forelimbs have become modified into rigid flippers involved in steering and stabilization while swimming. In addition, many whales possess dorsal fins which further aid in stabilization. An atrophied pelvis which is no longer connected to the vertebral column since it is no longer needed to support body weight. Instead, this structure serves to support for the genitalia. Smooth, hairless skin with an underlying layer of blubber for insulation. This fat layer can double as an emergency energy reserve during periods of fasting. Loss of the sense of smell and the development of an enhanced sense of hearing. 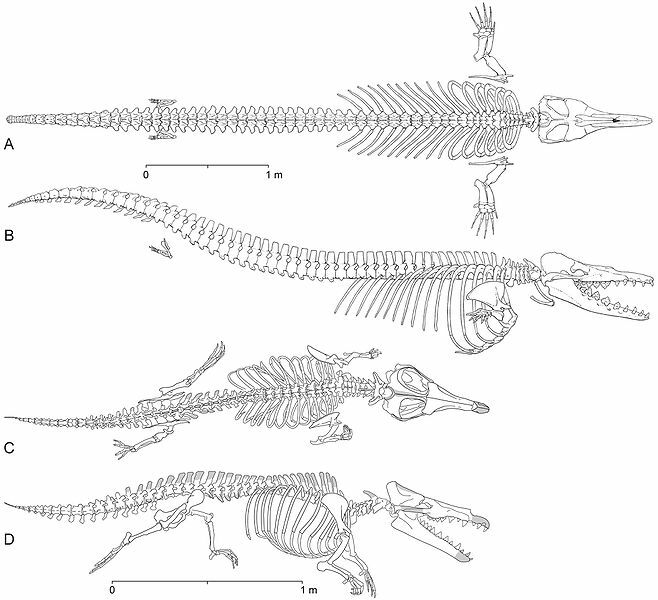 Skeletons of the archaeocete whales Dorudon atrox (A & B) and Maiacetus innus (C & D). manner similar to that of modern otters. 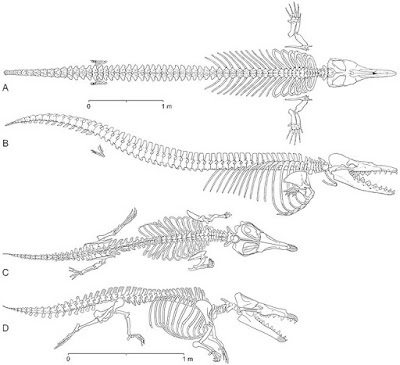 Figure 1 from Gingerich et al. 2009. Like their terrestrial ancestors, archaeocetes possessed a complete, heterodont* dentition which included conical incisors and canines adapted for gripping prey. Behind these were serrated, triangular premolars and molars which sliced prey into manageable pieces. This suggests that, like pinnipeds and otters, archaeocetes may have carried large prey to the surface of the water to be eaten as demonstrated here. Smaller prey items would have simply been swallowed whole. Early odontocetes, such as the squalodonts (shark-toothed dolphins), retained the gripping-slicing dentition of the ancestral archaeocetes although these had begun to add extra teeth. 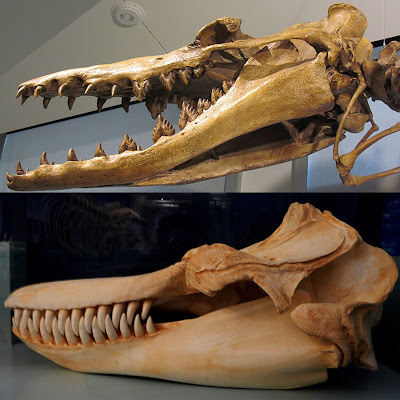 Later toothed whales became fully homodont* with many species developing a significantly increased dentition: some modern dolphins may have as many as 100 to 200 conical teeth lining their jaws in contrast to the 44-tooth maximum seen among archaeocetes and most other mammals. Members of the families Monodontidae and Ziphiidae have taken the opposite route, instead vastly reducing the number of teeth until many are almost toothless, although the males may have tusks which are used to combat other males. Early mysticetes also retained heterodont dentition, although these teeth atrophied over time as they were gradually replaced by baleen plates. Heterodont: possessing multiple tooth morphologies. Homodont: possessing a single tooth morphology.